This cranberry fig bath truffles recipe makes a lovely seasonal, homemade gift idea that’s sure to give you a new appreciation for this tiny tart fruit! Keep reading to learn how to make these giftable fragrant, fizzing bath truffles and discover some of my favorite food recipes for cranberries as well! I grew up with cranberry sauce (from a can) always being served at family holiday dinners. Not understanding at that point in my life how something that resembled Jello could come out of said can, I was never tempted to try it. And to date, I still have not. However, dried cranberries in salads or sweetened in desserts I do find appetizing. And of course cranberries immersed in cakes and breads make for a wonderful seasonal fresh baked fragrance that’s both tart, fruity and sweet. Now that I’m a third way through my life (I plan to live forever though!) I have a better appreciation of many foods that I did not have in my teens and twenties. And, while I still won’t eat cranberry sauce out of a can, classic homemade cranberry sauce and even cranberry chutney can garner a thumbs up when paired with favorites like pork or scallops. For the Love of Cranberry! 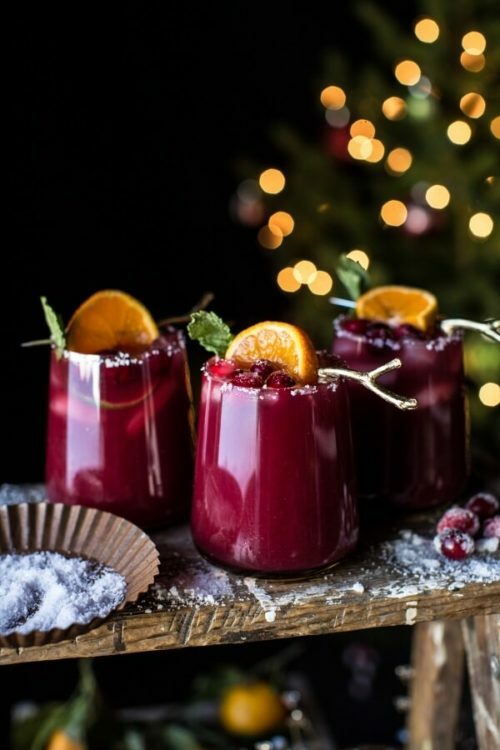 Some of my favorite cranberry recipes include this cranberry orange margarita recipe from Half Baked Harvest (one of my all time favorite food blogs!) along with some simply stunning cranberry wreath gingerbread cupcakes from Lauren Conrad, a dark chocolate cranberry bundt cake recipe from My Baking Addiction, and eggnog panna cotta with spiked cranberry sauce from Sprinkle Bakes. However, before you start checking your pantry for the ingredients to one (or all) of these lustful cranberry concoctions, I want to first share an awesome recipe for making cranberry fig bath truffles! 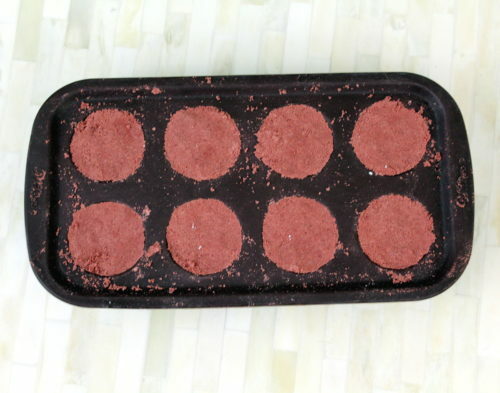 Similar to bath bombs (or bath fizzies) these homemade bath truffles are easy to make and work nicely with silicone molds. They also smell AMAZING! So much in fact that after I made these my house smelled like a blend of tart cranberries, sweet fig and subtle wood for days. 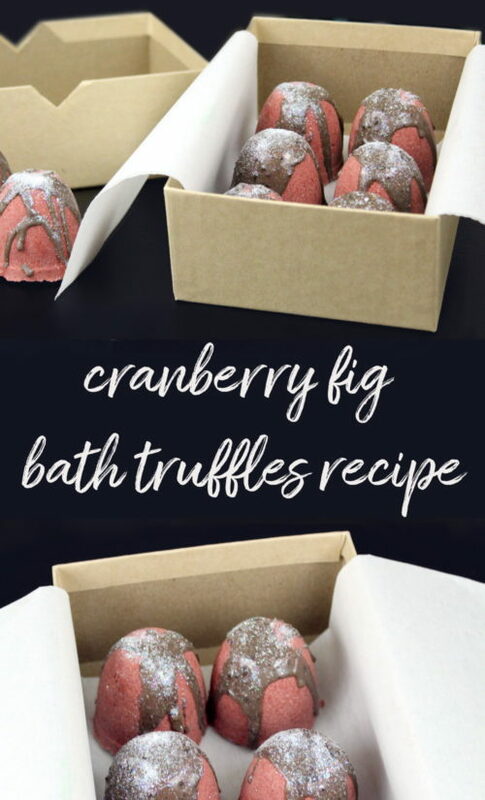 Additionally, my cranberry fig bath truffles are also great for gifting throughout the holiday season whether for a housewarming or hostess gift or even Christmas or Hanukkah gifts for family and friends. Following is the recipe. You will need a digital scale for my cranberry fig bath truffles recipe in order to weigh the ingredients. (I recommend this Baker’s Math Scale if you plan to make a lot of bath, body or soap recipes.) You will also need two Wilton Silicone Brownie Pop Molds which can be found both online as well as in most craft stores. Begin by weighing out the cocoa butter in either a double boiler or a heat safe glass container such as a glass Pyrex measuring bowl. Heat the cocoa butter in your double boiler or in your container in the microwave at 40% power until melted. Set aside to cool slightly. Using a teaspoon measure, measure out the sparkle pink mica and add to the other dry ingredients. Mix the dry ingredients thoroughly to combine. Combine the dry ingredients with the scented cocoa butter and mix well. You can now begin filling the cavities of your brownie pop molds. To do this, I recommend filling one cavity at a time. 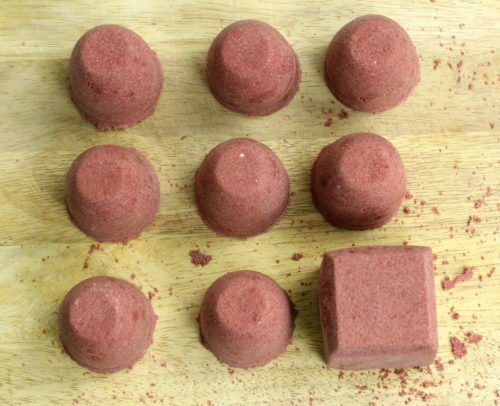 Loosely add the cranberry fig bath truffles mix to fill one cavity. Then pile more on top to form a mountain. Next, firmly press the ingredients into the mold cavity. Resist pushing so hard that the cavity bows out on the sides, but enough that the mixture is firmly packed. Once you’ve filled the mold, set it aside in a safe, dry location. 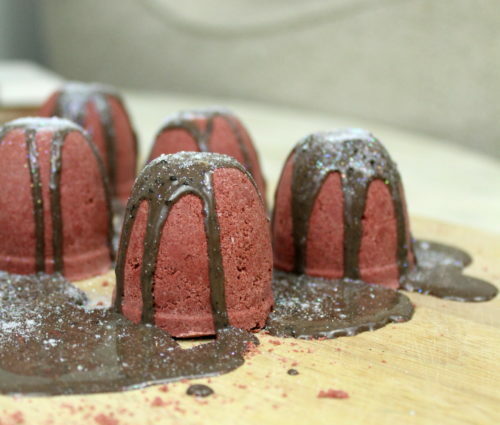 After one to two days, carefully unmold your cranberry fig bath truffles. To do this simply heat a small amount of white or clear melt and pour soap base of your choice in a small Pyrex measuring cup or glass scientific beaker until melted. 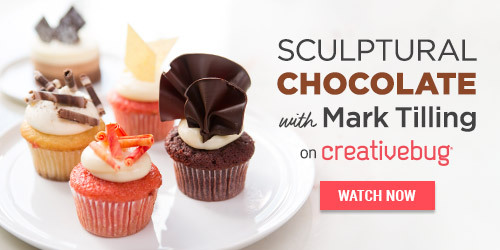 Mix in a small amount of unsweetened cocoa powder to suit for chocolate icing. Or use plain white melt and pour soap for white icing. Allow the soap to cool slightly. Once a thin film starts to appear on top of the soap, remix the soap then pour across the tops of your cranberry fig bath truffles. 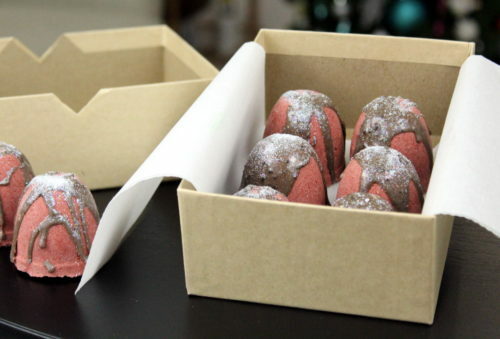 If desired, you can also sprinkle the tops of your bath truffles with a biodegradable cosmetic glitter of your choice before the soap fully cools and hardens. Once the soap has solidified, gently use a thin knife or utensil to remove your bath truffles from your work surface. Then package your bath truffles as desired for personal use or gifting. To use, simply add to warm, running bath water and enjoy the bubbles and fizz! 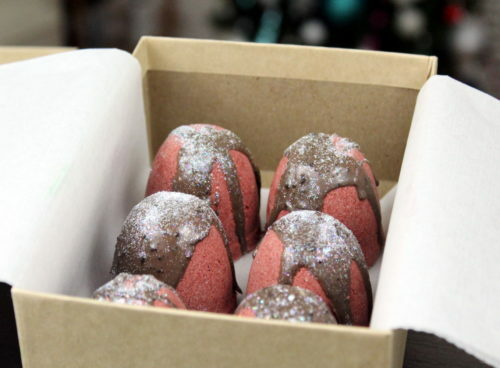 Paint Your Cranberry Fig Bath Truffles Instead! 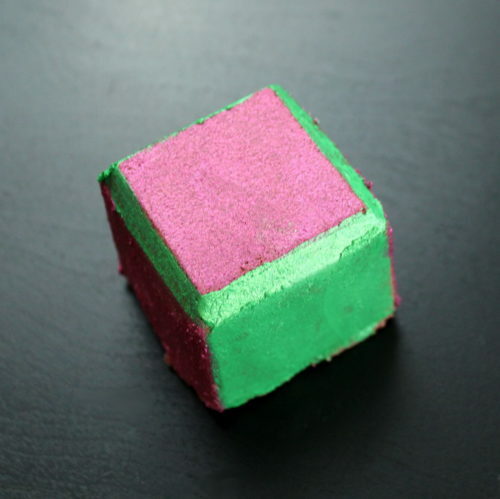 Then, using a small craft paint brush, paint your bath truffles as desired in blocks of color or with designs of your own creation. What If I Want to Sell My Bath Truffles? If you plan to sell your cranberry fig bath truffles, you’ll need to follow FDA guidelines for labeling your product. If you’re unsure about the rules and regulations regarding labeling cosmetics, I highly recommend the book, Soap and Cosmetic Labeling: How to Follow the Rules and Regs Explained in Plain English, by Marie Gale. It is important to note that, as this product contains SLSA, it is considered a foaming detergent bath product. Because of this labeling your bath truffles requires an additional caution to be printed on the label unless it states that the product is for adult use only. This is in addition to the ingredient list and directions for use and other information already required for cosmetic labeling. You can find more information on this at the FDA website here. For more great homemade gift ideas, be sure to check out my post on DIY holiday gifts that look store bought at Soap Deli News blog here. Additionally, you can also discover more homemade gift ideas and recipes via my boards on Pinterest. Want even more? Then be sure to follow me via all of your favorite social media platforms including G+, Tumblr, Facebook, Twitter, Blog Lovin’, and Instagram. Or subscribe to Soap Deli News via email for future updates, DIY projects and recipes. And don’t forget to also use #soapdelishowoff when sharing the products you’ve made from my recipes on Instagram. Rebecca D. Dillon is a soapmaker, DIY-er and blogger whose life is controlled daily by a dachshund. You can learn more about Rebecca by checking out her bio. Or discover more great skin care & beauty recipes by subscribing to Soap Deli News blog via email.